"It has been cold this winter on the East Coast. The temperatures have been ungodly. Where the **** is global warming?" No doubt about it, he's an angry guy, full of explosive vitriol on all sorts of topics, and the good thing is that he's also really funny. 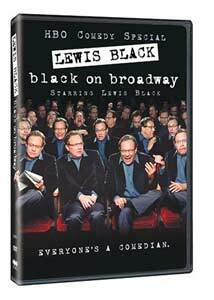 This 2004 standup performance, recorded for HBO at New York's Brooks Atkinson Theater, finds the hyphenated Black—the backcover of this DVD refers to him as a comedian/author/playwright/pundit—barrelling through a solid hour-long set with alternating doses of storytelling that builds to pressure-cooker style bursts of observation. Black is best known for his biting commentaries on Emmy-winning The Daily Show with Jon Stewart, and for his standup act here he continues to ply his frustrated Everyman approach to comedy. He wisely sidesteps wallowing too much in political humor, though he touches on the questionable logic of tax cuts and a quick bit of obligatory Republican/Democrat bashing, the bulk of his set covers disparate things like whole milk, global warming, and even the old standup staple of airplane travel (including a great bit about enduring the insanely long flight to New Zealand). He builds his rants with a deliberate and recurring style, beginning relatively calm by piling observation on observation until his aggravation level erupts in a stream of f***-laced exasperation. On the surface there is a hint of George Carlin's caustic, "screw you" attitude in Black's delivery, but though just as angry, he is somewhat more befuddled than accusatory. Black's take on the evolution of bottled water, nestled smack in the middle of his set, is one of the strongest moments of his consistently funny act, and he combines nostalgia about the simpler days of drinking water right out of tap into the lunacy of urban New Yorkers lugging one-liter bottles around in a pouch "as if they were crossing the goddamn Mojave". It seems that Black has the same kind of vein-popping annoyance with the majority of this country's so-called "meat with eyes", as he so tactfully refers to them, that plays perfectly into the wheelhouse of disgruntled folks everywhere. If, however, you're happy with the way things are going in the world, or you're satisfied with the Homeland Security color-coding system, Black's observations will likely seem dreadfully cynical and argumentative. My advice, if that's you, is to move along and let the rest of us have a good laugh. Image Transfer Review: Issued in its original 1.33:1 full-frame presentation, as it was shown on HBO, this disc sports a nice-looking palette of primarily deep blues, purples and blacks, with no evidence of smearing. Fleshtones appear natural, and the obligatory audience shots are relatively devoid of grain. Audio Transfer Review: Audio comes in a simple but presentable 2.0 surround track, and Black's rants sound perfectly discernible and clear at all times. There's nothing fancy going on here, but there's no hiss, crackle or distortion. Extras Review: No extras at all, but the disc is cut into 15 chapters. It takes a lot for a standup act to make me laugh out loud while I'm watching at home, by myself. Black on Broadway achieves this, and when I watched it a second time I still laughed. The observations are dead on, and his frustration levels seem very relatable. In the immortal words of Corky Romano, "it's funny because it's true." This guy has the funny.